Hello Portland Oregon! I had an Amazing trip visiting Portland with Jasmine Worth. We spent 7 Days there visiting many Delicious Food Trucks, tasting Micro Brewed Beer and eating large portions of Mac and Cheese. While we where there we had to visit Many of Portland’s Best Food Establishments as well as some of the Best Tattoo Shop’s the city has to offer. I’ve long wanted an opportunity to visit Art Work Rebels, a Custom Tattoo Shop on the South West Side of Portland. 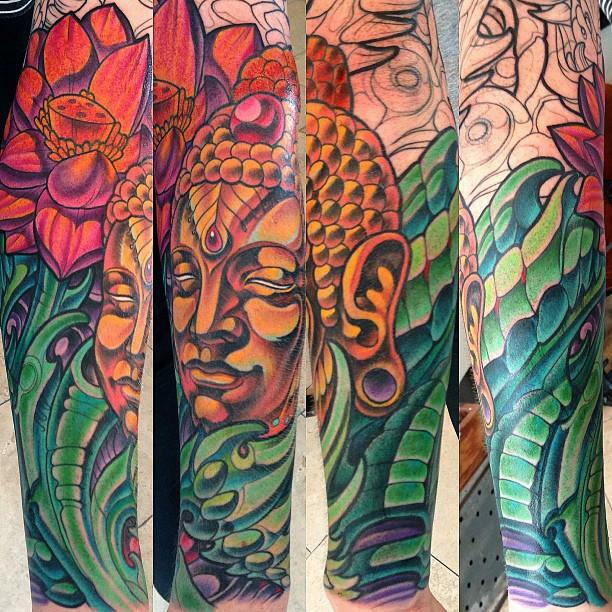 This Tattoo Shop is Owned by former San Francisco Tattoo Artist Jason Kundell. Art Work Rebels is one of Portland’s Premiere Tattoo shops. It has many of California’s Best Tattoo Artist circulating as Guest from famous Shops such as Memoir Tattoo in Los Angeles to Seventh Son and Skull and Sword in San Francisco. I’ll be Traveling from Remington Tattoo in San Diego Next year to spend a Month enjoying Portland and Tattooing at Art Work Rebels. I’ve wanted to visit portland for a long while, long before the Show Portlandia ever reached Television. It’s everything I dreamed it would be and more. It’s a Beautiful City full of Rivers, Mountain Ranges, Water Falls, and Trees!!! I can’t beging to express how amazing beautiful all the Trees are. If you are up for a Awesome Adventure in a Wonderful City I can recommend Portland Above and Beyond many places to Travel and have an Incredible Vacation in the USA. If you are a Craft Beer and Food Lover who enjoys Hiking and Nature Portland Oregon is your Place. I spent the greater majority of my town in the South East and West. We had a chance to see Trek in the Park, a Fun Free Event where you can see a community Play of Star Trek Episodes. Unfortunately it was the Last Performance as Trek in the Park, but we where informed the Acting Troupe will continue on with a New Theme. Previous postSan Diego CustomTattoo Artist Terry Ribera makes an Art Nouveau Girl with Peacock Feather and Roses.